For the fourth consecutive year, Neugart has been awarded the Festo Supplier Elite Award. The large corporation, Festo, uses this award to commend the quality and reliability of its partners. 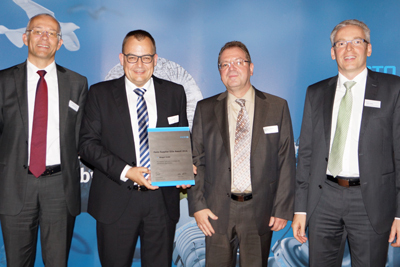 Neugart was honored by Festo in the categories of quality, delivery performance and service. The award was presented during a ceremony at Schloss Filseck in Uhingen, Germany. Key Account Manager from Neugart, Andreas Dressler accepted the award alongside Bernd Neugart. Festo CEO Dr. Klaus Jessen and Heiko Callies, Head of Global Purchasing presented the award on behalf of Festo. Neugart was the sole gearbox manufacturer recognized among the excellent suppliers. Neugart develops, designs and manufacturers its products completely on its own. Festo set strict criteria for receiving the award. Not only did Neugart clearly demonstrate the best results for product quality but also on issues relating to logistics, quality management and service. The technological expertise, environmental conduct and the price-performance ratio also played a role in the selecting process.